Genetically modified (GM) food aid bound for Africa has long been a bone of contention among governments, scientists, activists, consumers and aid workers. On 18 August a drought-affected Kenyan government fired the head of its National Biosafety Authority for expediting the process to import milled food aid which might have contained genetically modified organisms (GMO). In the weeks preceding and after the incident, public debate on the issue was distorted by extreme positions either for or against GM food. “When you have people starving in your country you don’t simply turn your back on food at your door-step just because it is labelled GM - it is expected that biosafety risk assessments should have been conducted before the importation of the food to see whether it does indeed pose a threat before taking a decision. Taking this decision so late in the day could have serious consequences for the suffering people,” says Diran Makinde, director of the New Partnership for Africa’s Development’s (NEPAD’s) African Biosafety Network of Expertise (ABNE), a pool of scientific experts set up by the African Union. There have been different degrees of resistance to GM food and GM food aid in Africa. In 2002 Zambia announced it would not accept GM food aid in any form. Positions were polarized to a great extent after a quote from a US state department official, “Beggars can’t be choosers”,hit the headlines. It prompted the then president, Levy Mwanawasa, to say hunger was no reason for feeding his people “poison”. Since then Zambia has become a poster-child for the anti-GM lobby. Zimbabwe, Malawi and Mozambique said they could allow imports of GM food aid in its milled form as this eliminated the risk of the germination of whole grains and limited possible contamination of local varieties. Lesotho and Swaziland allowed the distribution of non-milled GM food/grains, but warned people that it was for consumption not cultivation. In 2004, Angola and Sudan announced restrictions on GM food aid. Most African countries approach GM technology applied to crops with caution. “Why shouldn’t we be wary of this technology and its possible long-term health impacts, if the EU [European Union] is. If it is not good for them, why should it be good for us?” said Tewolde Egziabher, Ethiopia’s director of the Environmental Protection Agency. Egziabher was one of the main architects of the Cartagena Protocol, the international law on biosafety which came into effect in 2003 and which allows countries to impose bans on foods containing GM. The Protocol’s cornerstone is “precaution”, notes a UN Environment Programme briefing. It gives governments the discretion to impose bans even where there is insufficient scientific evidence about the potential adverse effects of GM crops. The USA has yet to ratify the Protocol. GM technology injects foreign genes into a crop that can improve its appearance, taste, nutritional quality, drought tolerance, and insect and disease resistance. There has been cautious optimism about the new technology in some quarters. “As crop yields drop because of weather shocks, GM technology is not the panacea, as Africa will feel the impact of climate change in the long-term. But it is potentially yet another tool in our fight to improve production,” said Per Pinstrup-Andersen, 2001 World Food Prize laureate and the author of a book on the politics of GM food. Most critics of GM food, however, argue that foreign genes can produce toxic proteins and allergens, even possibly transfer the genes to bacteria in the human gut; or transfer these traits to other crops with unknown consequences. A deep mistrust also prevails in Africa, given the fact that two power blocs - the EU and the USA remain divided over GM. Only one strain of GM maize, Monsanto 810, and one modified potato, have been approved in the EU, and most countries grow neither commercially. Spain accounts for about 80 percent of GMO grown in the EU in terms of land under cultivation, but Austria, France, Greece, Hungary, Germany and Luxembourg have banned all GMO cultivation. On the other hand, in the USA, where 70 percent of maize is GM, GM food need not be labelled. Some food experts say both the EU and the USA have vested interests in promoting their respective views in Africa, which is seen as a potential market and supplier of either GM or non-GM products. In Africa, the production of GM food is still in its infancy. South Africa (70-80 percent of its maize, soya and cotton production), Egypt (maize) and Burkina Faso (cotton) are the only African countries commercially producing GM crops, according to ABNE. Traditionally the USA has been the biggest donor in kind to the World Food Programme (WFP). 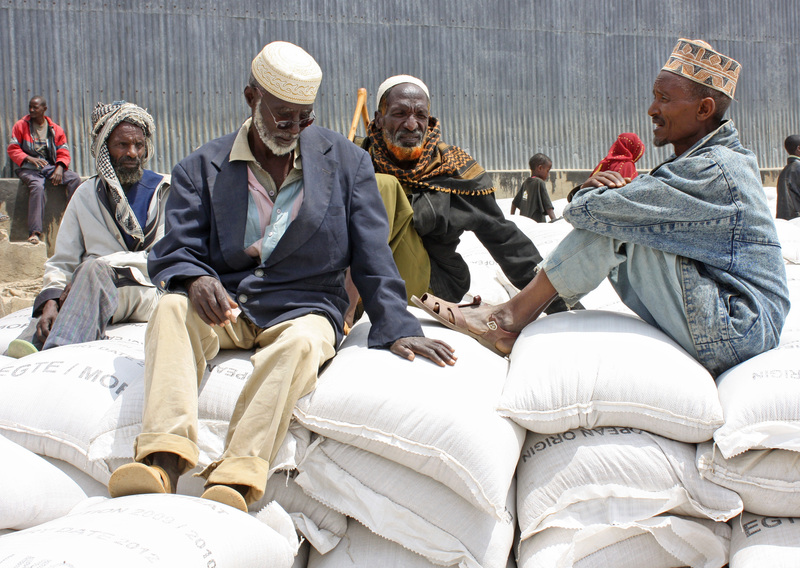 But the aid agency is trying to broaden its source of food aid. In 2010, WFP said 36 percent of its food aid, or two million out of 5.7 million tons disbursed globally, was procured in developing countries. While wheat accounts for more than 50 percent of WFP’s global cereal component, GM wheat does not figure as it is not grown commercially. According to data from 2006, at least 38 percent of cereal food aid to Africa was wheat and wheat flour, said Christopher Barrett, a food aid expert. Though wheat tends to be a less important part of the African diet than maize, aid agencies sometimes offer wheat instead of GM maize in emergencies. Milling the grain is an obvious solution, said Julia Steets, an aid policy expert at the Global Public Policy Institute. "Milling either at source or in the port of arrival or in the prepositioning warehouses - it would of course also help to know in advance which governments take what positions on that, so that the food aid agencies are prepared." If a country is not receptive to GM food - “give the country the money for procurement of the food from an African country with a surplus (local procurement is better than shipping food all the way from the US any way),” said Pinstrup-Andersen. Food aid agencies in Africa usually turn to South Africa for surplus maize. The country has systems in place to segregate non-GM from GM, says Thom Jayne, professor of international development at Michigan State University. Farmers in South Africa certify non-GM content by conducting a basic test, which detects specific proteins produced by a GM plant. The non-GM grain is separated from the rest before being shipped. Another way of separating GM from non-GM crops involves contract-farming schemes first set up in 2004-2005. The process involves the purchaser identifying farmers who buy non-GM seed. Tests are conducted on their field for any traces of GM before they are offered a contract. But all these measures involve extra costs. In 2001 the African Union drafted the African Biosafety Model Law but taking an even more cautious approach than the Protocol, allowing countries to adopt more stringent measures to assess the safety of GM food. National biosafety laws exist in 17 of the 54 African countries. In most countries, the legislation is a work-in-progress. Labelling and verifying the content of a crop on a day-to day basis is an outstanding issue. South Africa, the first country in Africa to put biosafety laws in place (in 1997), has yet to develop a labelling process. Moustapha Bachir regardait un match de qualification pour la Coupe du monde dans un bar quand les djihadistes de Boko Haram sont arrivés à Amchidé, dans la région camerounaise de l’Extrême-Nord.